Even as he thought of emperumAn’s vAmana avathAram, AzhwAr thinks of how he [emperumAn] changed his identity to incarnate as SrI rAma and as krishNa, in order to protect such followers, and had to put up with much suffering. He is disgusted that such a gentle and soft entity as emperumAn had to suffer so much while people of this world protect only their physical forms and ensure that no harm comes to their forms. azhagiyadhE – are these apt? thirindhadhu venjamaththuth thEr kadavi – [emperumAn during his incarnation as krishNa ] wandered in the cruel mahAbhAratha war as charioteer, clashing with armies. Even there, was he the chief, getting jobs done through others? He was a mere charioteer for arjuna, crediting arjuna for all the victories and taking the arrows directed at arjuna on himself, by being in the forefront. In battles, usually, the warriors on chariots will first direct their anger on the charioteer [of enemy] and incapacitate him so that it would be easier to tackle the enemy on his chariot. krishNa sat as charioteer under the feet of arjuna, without any armour to protect him when the opponents came at him with their weapons. venjamaththuth thEr kadavi thirindhadhu – [emperumAn] made the armies clash with each other. Did not the arrows shot by one bhagadhaththan fall on krishNa! Has it not been said in mahAbhAratham dhrONa parvam 29-18 “urasA prathi jagrAha pArtham sanchAdhya mAdhava: ” (kaNNan hid arjuna and took the arrows on his chest)! It appears that while kaNNan thrust his chest to take the arrows which were directed at arjuna, pirAtti (sitting on the chest of emperumAn) took the arrows on herself. Did not pirAtti say in SrI rAmAyaNam ayOdhyA kANdam 27-7 “agrathas thE gamishyAmi” (I shall precede you, in protecting our followers)! anRu pirindhadhu sIthaiyai mAn pin pOy – going behind the deceptive deer, did he not get separated from sIthai! Hasn’t thirumangai AzhwAr mercifully mentioned in his periya thirumozhi 2-5-6 “kiLar poRiya maRithiriya adhanin pinnE padarndhAnai ” (he went behind the deceptive deer which had spots all over its body and which was wandering in their presence)! The deceptive deer had spots on its body to attract sIthAppirAtti. 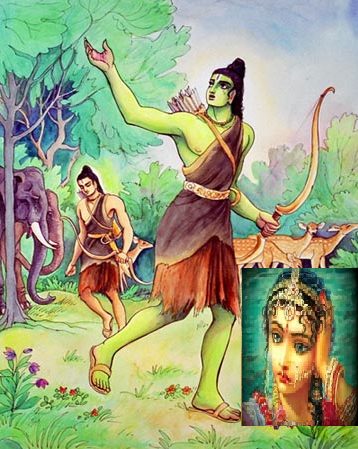 As it was moving about in their presence, sIthAppirAtti requested SrI rAma to secure it for her. SrI rAma went chasing it. However since it was a cruel deer, it did not yield itself to him and tried to escape from him and he also kept chasing it. This chase went so far that ultimately it led to his separation from pirAtti. mAn pin pOy pirindhadhu sIthaiyai – were we fortunate to have emperumAn and pirAtti together when they came to protect us? (Did they not separate from each other to protect dhEvas (celestial entities))! They are together, to protect others. They get separated, also to protect others! sIthaiyai – SrI rAma had mentioned about sIthAppirAtti in SrI rAmAyaNam AraNya kAndam 10-21 “prANEbhyO garIyasI” (you are greater than my life). He had to get separated from such pirAtti. purindhadhuvum kaN paLLi koLLa – what he did or what he desired. kaN paLLi koLLa – kaN refers to place. Here it refers to the hard ground. In his younger days, SrI rAma had slept on grass as mentioned in SrI rAmAyaNam bAla kANdam 22-23 “thruNaSayanE anuchithE” (it was not apt for him to sleep on grass). While he [dhaSaratha] wept uncontrollably at this, SrI rAma had to sleep on the hard ground, without even grass. He had to wander in the forests, without even a village in sight. How cruel it was! Did not dhaSaratha cry out, as mentioned in perumAL thirumozhi 9-3 “kallaNaimEl kaN thuyilak kaRRanaiyO kAguththA” (Oh kAguththA! [another name for SrI rAma] did you learn how to sleep on stone-bed? I, who had sent him to the forest, did not train him to sleep on stone-bed too, cries dhaSaratha). kaN paLLi koLLa – while lakshmaNa spread out a bed of leaves for SrI rAma to sleep on, because of his separation from sIthAppirAtti, without knowing that, he slept on hard ground. azhagiyadhE nAgaththin thaN paLLi koLvAn thanakku – for one who, when he sleeps on the mattress of AdhiSEshan, his followers will fear as to what will happen to his soft divine form, is sleeping like this [on hard ground] apt? Hasn’t periyAzhwAr mercifully said in thiruppallANdu 9 “paduththa painnAgaNaip paLLi koNdAnukku” (to emperumAn who sleeps on the mattress of AdhiSEshan who has well spread hood)! thirumazhisai AzhwAr too has mercifully said in nAnmugan thiruvandhAdhi 35 “thALAl ulagam aLandha asaivE kol vALA kidandhu aruLum vAy thiRavAn nILOdham vandhalaikkum mAmayilai mAvallikkENiyAn aindhalai vAy nAgaththaNai” (Is it that emperumAn is tired of measuring all the worlds with his divine feet that he is silently lying on the bed of AdhiSEshan in mayilaiththiruvallikkENi which is lapped by the waves from ocean!). He has thought that the reason for lying in such a cool place is because he is probably tired. azhagiyadhE – does it not appear that protecting the world like this (wandering in the forest in search of sIthAppirAtti and driving the chariot for arjuna, taking all the arrows aimed at arjuna on himself] is not apt for his divine form! azhagiyadhE nAgaththin thaN paLLi koLvAn thanakku – AzhwAr feels very sad that he had to lie down on hard ground, when he has such a soft divine form with which he normally reclines on AdhiSEshan; that he had to wander around in search of sIthAppirAtti; that he had to wander in the battle field being ridiculed by the others. He asks whether it is apt for him to protect the world after doing all these? Does he have to protect his followers only by doing all these? AzhwAr mercifully asks with sadness whether he, the primary entity, has to destroy himself like this and protect his followers. We shall take up the 16th pAsuram next. This entry was posted in iraNdAm thiruvandhAdhi, iyaRpA on October 15, 2017 by T N Krishnan.